WebDAM is a digital management application that offers users a plethora of tools designed to give their teams that edge when working with high value digital assets. Simply put, WebDAM helps you and your team work faster and smarter. 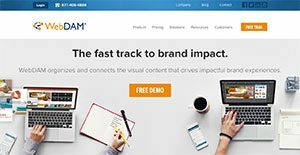 Branded as one of the best digital asset management cloud apps in the market today, WebDAM enables creative and marketing professionals to do everything in the cloud, from controlling, storing, managing, and sharing. With such features and functionalities, WebDAM is an excellent digital management platform for company photos, graphics, illustrations, marketing materials, sales presentations, documents, movies, Photoshop files, PowerPoint files, audio and more. It is so reliable and efficient that more than 200,000 marketing professionals are using WebDAM right now. With the system virtually compatible with practically every file type, WebDAM also boasts of unparalleled user friendliness and lightweight functionality, even when incorporated with very powerful features. For users, WebDAM makes it easy to create, manage, secure, collaborate, and distribute digital media as everything is streamlined. Leveraging powerful cloud technology, you can securely access and work with your digital files anytime, regardless of location. WebDAM offers a wide range of features and tools designed to make your teams become more productive and fast when it comes to a working valuable digital assets. WebDAM essentially streamlines marketing operations for enterprises regardless of size. With WebDAM, it is easy for team leaders and managers to attain connected workflow. The platform enables users to unify and manage teams, marketing assets, and even your design apps from a single cloud-based interface. Brand control is also a walk in the park. With digital brand guidelines and simple permission-based distribution of assets from the cloud, users are assured that everyone working in the brand network is on the same ground, making collaboration, communication, and coordination easy and effective. Asset discovery is another benefit WebDAM provides to its users. They can easily connect to any asset source and expand the possibilities with integrated access to millions of visual assets on Shutterstock. As WebDAM is an enterprise ready platform, users can scale their business and up their performance with Amazon Web Services, and optimize adoption using WebDAM’s documentation and best practices. Simply put, WebDAM has all the tools and features you need to manage your brand as well as thrive in the digital era. The software delivers a complete resource that keeps your brand on point and enables you to set digital brand guidelines that can be updated and distributed without much difficulty. Also, WebDAM enables self-service fulfillment with permission-based cloud access. Organizations have unique needs and requirements and no software application can be ideal in such a situation. It is useless to try to find an ideal off-the-shelf software app that fulfills all your business wants. The smart thing to do would be to modify the application for your special wants, employee skill levels, finances, and other elements. For these reasons, do not hasten and invest in well-publicized popular applications. Though these may be widely used, they may not be the ideal fit for your particular needs. Do your homework, check out each short-listed system in detail, read a few WebDAM reviews, speak to the seller for explanations, and finally settle for the application that offers what you require. How Much Does WebDAM Cost? We realize that when you make a decision to buy Digital Asset Management Software it’s important not only to see how experts evaluate it in their reviews, but also to find out if the real people and companies that buy it are actually satisfied with the product. That’s why we’ve created our behavior-based Customer Satisfaction Algorithm™ that gathers customer reviews, comments and WebDAM reviews across a wide range of social media sites. The data is then presented in an easy to digest form showing how many people had positive and negative experience with WebDAM. With that information at hand you should be equipped to make an informed buying decision that you won’t regret. What are WebDAM pricing details? What integrations are available for WebDAM? If you need more information about WebDAM or you simply have a question let us know what you need and we’ll forward your request directly to the vendor.